Hi everyone, wanted to drop in and introduce myself. I'm the proud new owner of a 2001 270! The boat is solid, needs a little love here and there but I'm looking forward to the project. 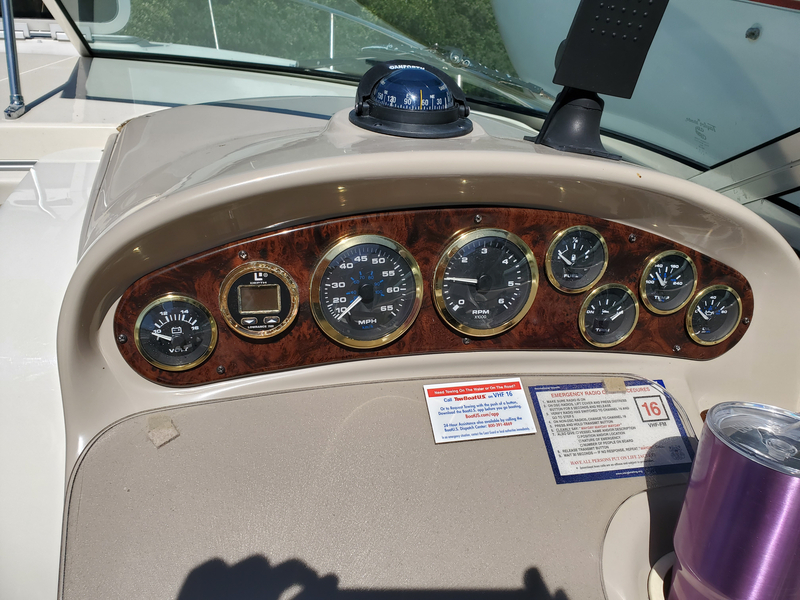 It has a new 383 stroker with under 40 hours on it, and the transom assembly is being replaced with a new one as we speak. Props are in good shape. Electrical probably needs to be severely overhauled. 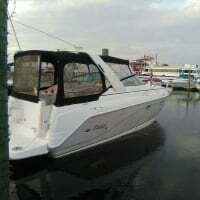 This will be my first boat ever, so I'm just starting on the learning curve, but I'm coming up to speed quickly I think, just gotta get some water time. Anyhow, looking forward to figuring out how do do just about everything from scratch, see y'all around. P.s. Had a great first experience in the boat, started sinking on my maiden voyage two weeks ago. 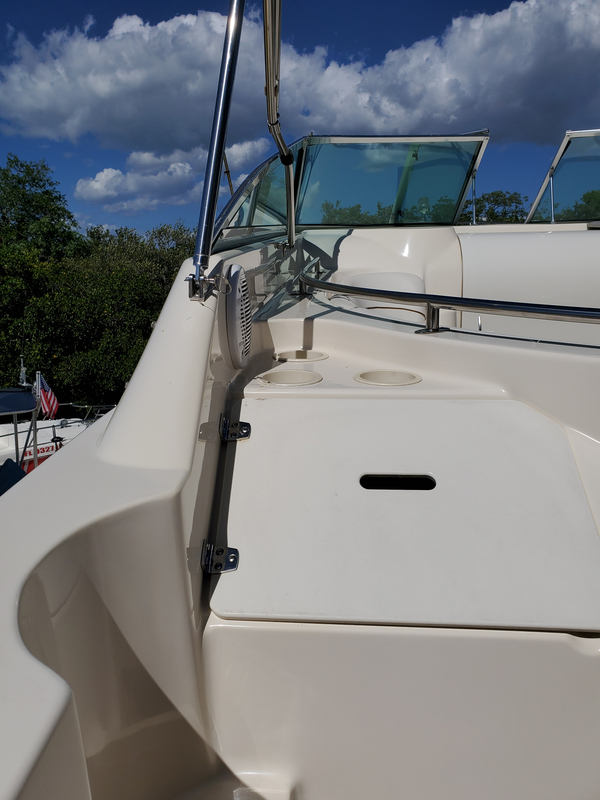 Exhaust pipe and transom assembly both popped holes... made it a whole 30 feet from the doc before coming back in. Congrats on the new ownership and welcome to the forum, lots of help available here. Welcome @LaxBouncer. You've come to the right place. Lot's of 270 owners on here too, so lot's of help. 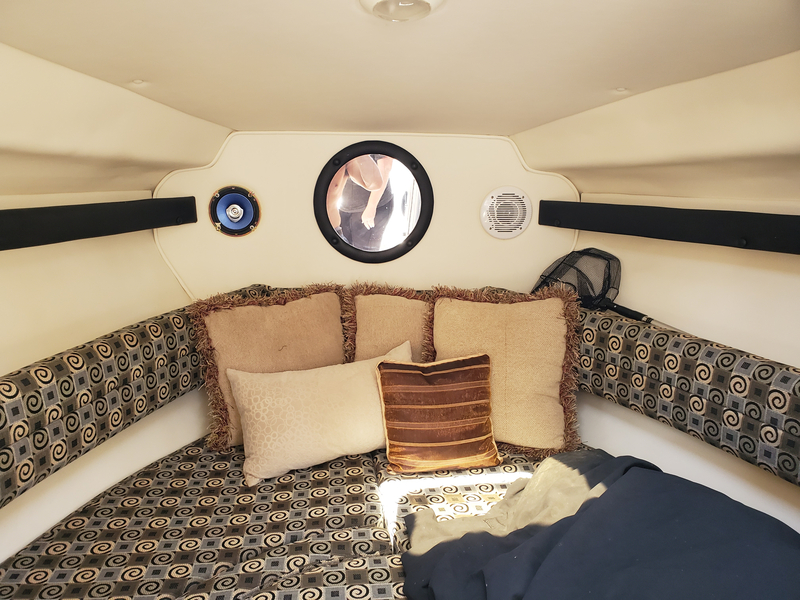 To choose what may be a bit of a "project" boat for a first boat takes some cojone's. Hopefully you're a handy guy, or have a deep wallet, or both. 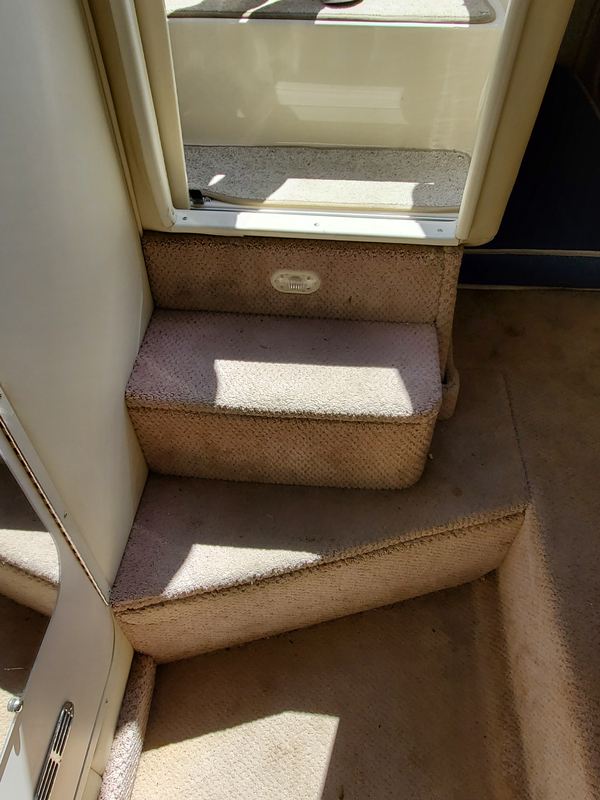 On a positive note, those era 270's are built like tanks, so if the mechanical's are good and you get the wiring straightened out you'll have an excellent vessel. Was there a hull survey done? 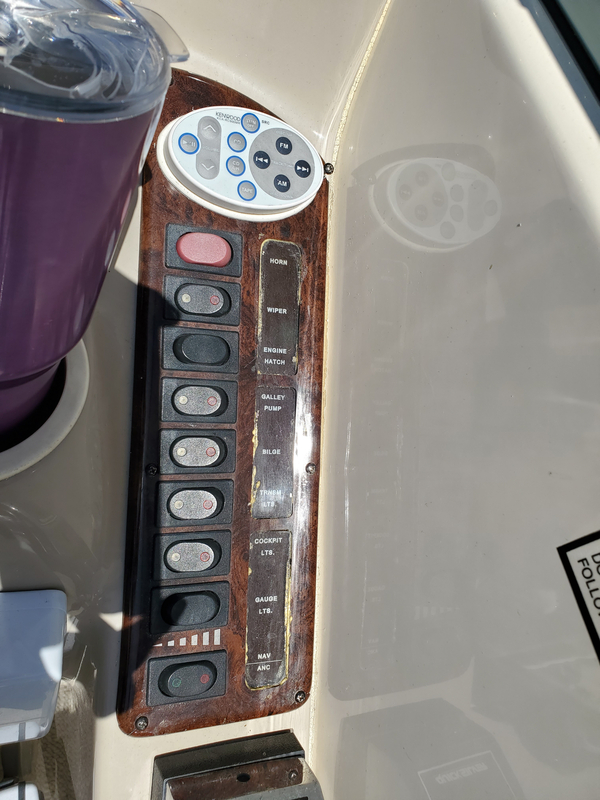 Being it's your first, please consider taking a boater safety class from the Power Squadron or Coast Guard Auxiliary or anybody else who offers them locally. It's kinda scary how many people operate a boat without any kind of training. Welcome, I have an 03' 270. Let me know if I can answer any questions. I certainly will, also going to have the aux do a safety check on it. There wasn't a survey done, I bought it from a friend I work with. I did have the mechanic check it out when he was diagnosing the leak, he's been working on this boat for years and felt comfortable. I'm sure I'll learn pretty quickly either way. I am handy when it comes to houses and cars, hopefully that will translate to the boat too! Thanks all for the welcome, I'll try to post pictures later today after work. Welcome to the forum! The 270 is really a great boat! There's so much here that you can soak up and learn. Feel free to ask any questions as you go long. No questions are dumb here. Sounds like you'll have a good boat when you have it ready to drop in soon! Safety check and USCGA course will have you light years ahead of most new boaters starting out. That is great! I'll add my welcome ... to one of the best boating resources on the interwebs. For a first-time owner, it seems like you're asking and doing all the right things. Welcome to the family! Welcome 270 brother! No better help will you find them here...bring it on! 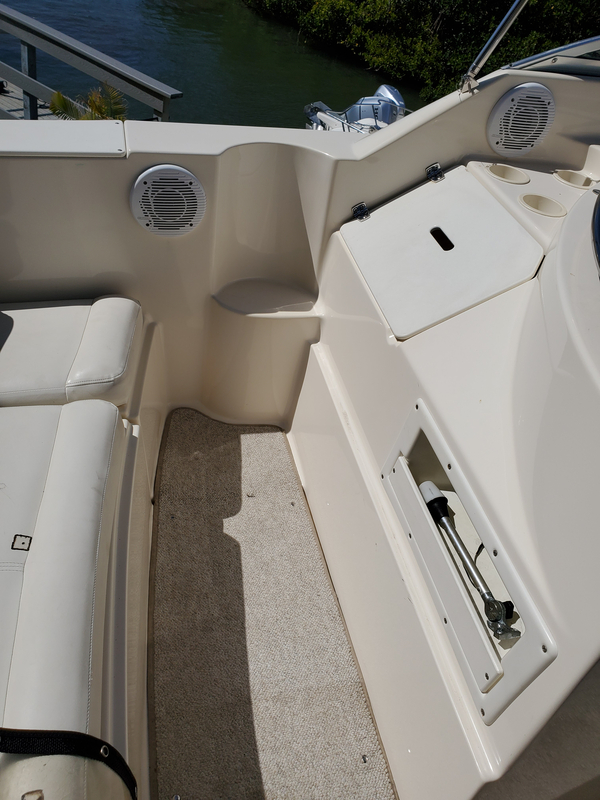 Congrat's on your new 270, fine boat, they all need some love from time to time. 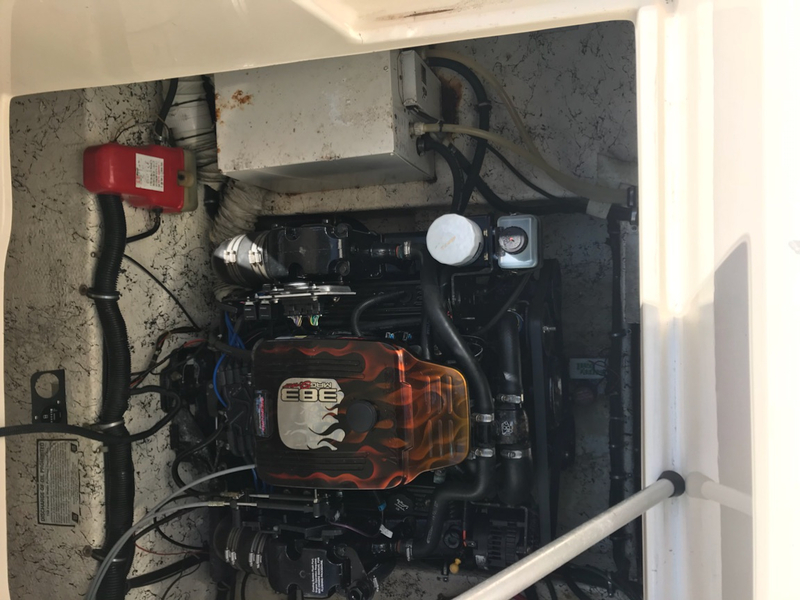 New engine, and transom assly, is a great plus. I agree, I want to see some pictures Lax! 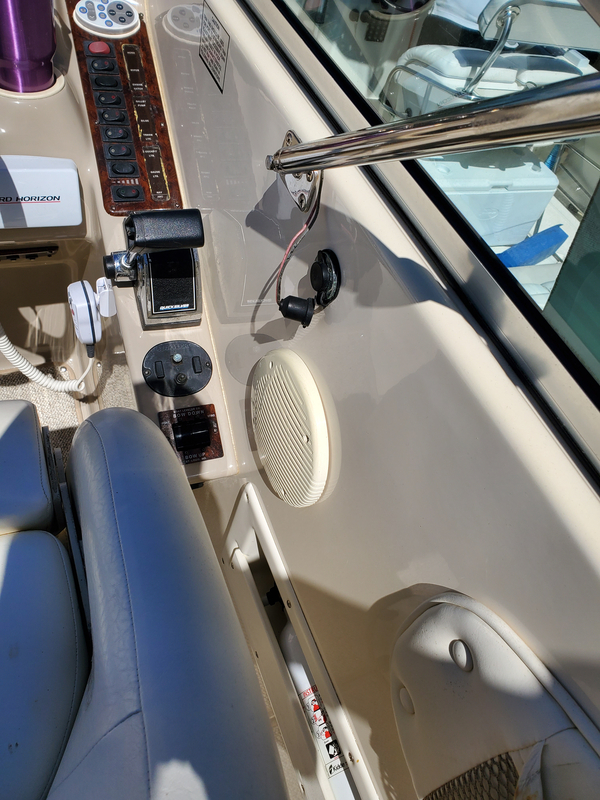 Here's some shots, I didn't want to include the transom because I haven't changed the name yet and don't want to step on the previous owners toes. Needs a good detail, all of the seams/gasketing looks like it needs to be stripped cleaned and resealed, stereo doesn't work, and then it's on to making it my own! I'm the absolute worst at photos, especially of boats, so sorry for the crappy pics. @LaxBouncer from the pics she looks pretty good. 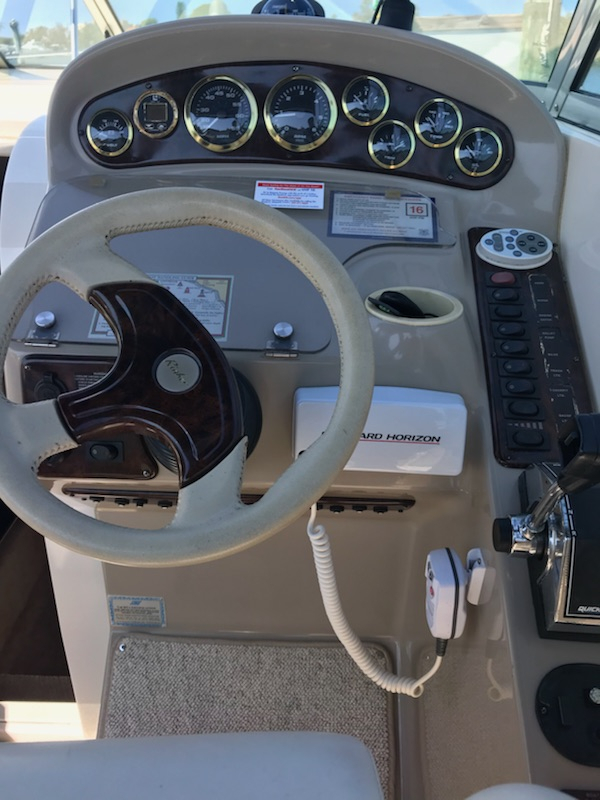 My 2000 is identical except for the design of the upholstery in the cabin and I have the radar arch. And of course your 383 stroker. There are a few others with 2000 and 2001 models on here also so if you have any questions at all the odds are pretty good that one if us has seen it before. Looks good! 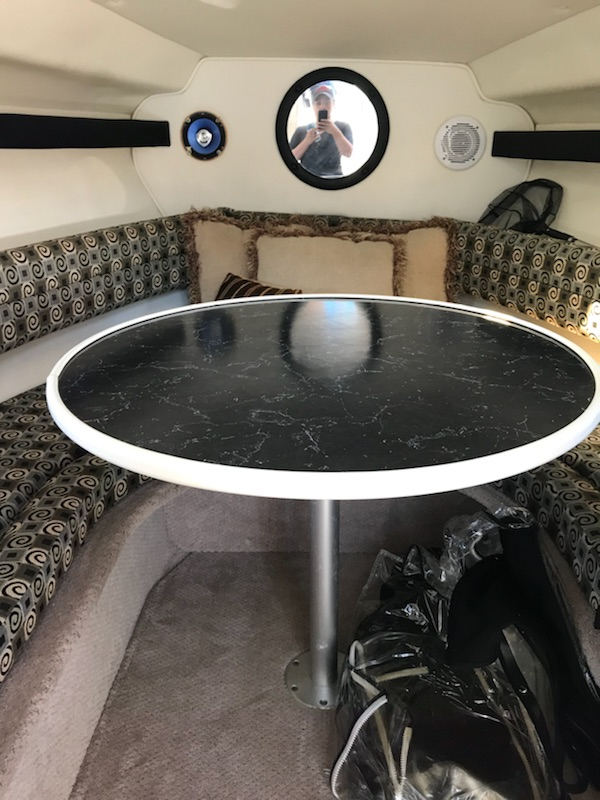 I like the fabric on your interior much better than mine...mine is an 06- perhaps yours was redone but at least in the pictures is all looks pretty good....and the way it's being launched I assume it was kept in covered dry storage so your luck there....get her in the water and make some waves! Hate the shaggy carpet I've got, love the carpet you've got. First thing I fix after moving south. No bottom paint was either fresh water or rack stored ??? Previous owner had a dry dock, the marina I keep it at has it on a rack (not covered sadly, all those were occupied). To my knowledge has always been saltwater. Not sure if that is you/a buddy or marina help under that forklift but I wouldn’t recommend walking under it or even close to under it. I work in an industry where we work with heavy equipment and mechanical equipment fails all the time and you don’t want to be in the firing path when it does fail. The picture actually looks like he is under it but it’s hard to tell if he is or if he is on the side. 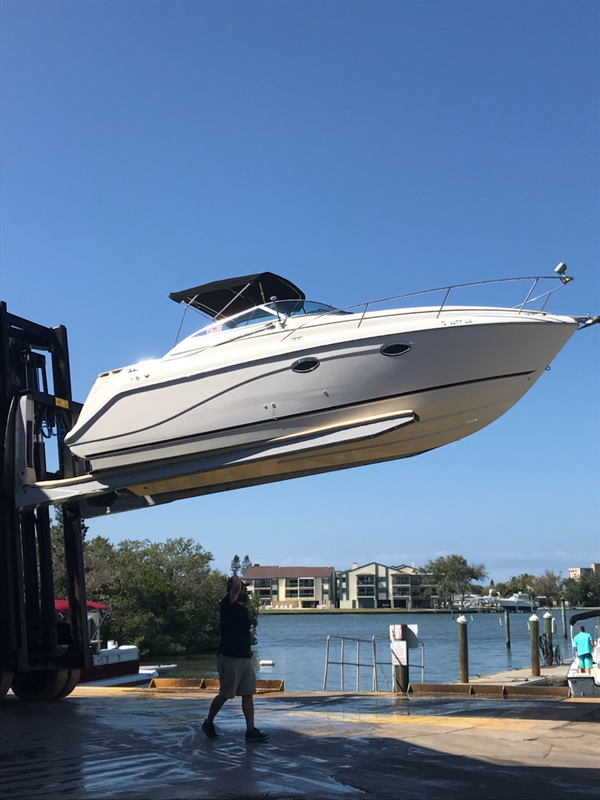 Congrats on on the boat and welcome to the Rinker family. @rasbury I have the same fabric in my 2001 242. It was a stock fabric, I think Great Lakes skipper has the fabric also. Congrats! I have the same boat on lake Michigan. Added the 383 2 yrs ago. Easy updates are Stainless steel cut holders, 2nd hiuse battery, Vessel View to phone or tablet, LED lights, etc. Shout w questions, tons of knowledge on this forum, i am grateful for the time money and stress this forum has saved me. Be safe!